(OMNS Aug 27, 2013) The pharmaceutical industry, and many doctors, appear to be making great efforts by to get as many people as possible vaccinated against shingles. Even if such an intervention was highly effective in preventing shingles, which certainly has not been shown to be the case, the information below should make it clear that such vaccinations are unnecessary. The side effects that would be suffered by a significant number of individuals need never occur in the first place. The real problem is that what is discussed below generates relatively little income for anybody in the healthcare industry. Regardless, you need to decide for yourself. Shingles is an infection resulting from the varicella zoster virus, usually manifesting in areas supplied by spinal nerves, known as dermatomes. More commonly known in medical circles as Herpes zoster, the infection is typically characterized by a blistering skin rash of extraordinary pain for most individuals. The initial infection with the virus is usually remote from the shingles outbreak, typically occurring in childhood when chickenpox is contracted. For years the virus remains latent in nerve cell bodies or autonomic ganglia. It is when the virus, for unclear reasons, breaks out of these storage sites and travels down the nerve axons that shingles occurs. Left to itself along with mainstream therapies that include analgesics, antiviral agents like acyclovir, and corticosteroids, the rash will generally resolve in two to four weeks. The pain is generally lessened little by analgesics. Some unfortunate individuals can experience postherpetic neuralgia, a syndrome of residual nerve pain that can continue for months or years following a shingles outbreak. The clinical response of shingles to vitamin C therapy is decidedly different from its response to traditional therapies. While there are not many reports in the literature on vitamin C and shingles, the studies that do exist are striking. Frederick Klenner, MD, who pioneered the effective use of vitamin C in a wide variety of infections and toxin exposures, published the results of his vitamin C therapy on eight patients with shingles. He gave 2,000 to 3,000 mg of vitamin C by injection every 12 hours, supplemented by 1,000 mg in fruit juice by mouth every two hours. In seven of the eight patients treated in this manner, complete pain relief was reported within two hours of the first vitamin C injection. All patients received a total of five to seven vitamin C injections. Having had shingles myself years before I knew of the efficacy of vitamin C therapy, I can assert that this is nothing short of a stunning result on what is usually a painful and debilitating disease. Furthermore, the blisters on Dr. Klenner's patients were reported to begin healing rapidly, with complete resolution within the first 72 hours. As with other infectious conditions, Dr. Klenner hastened to add that treatment needed to continue for at least 72 hours, as recurrence could readily occur even when the initial response was positive. Dr. Klenner also found a similar regimen of vitamin C just as readily resolved the blistering lesions of chickenpox, with the recoveries usually complete in three to four days. Similar clinical response by chickenpox and shingles to vitamin C is further evidence, albeit indirect, that the chickenpox virus and the later appearing Herpes zoster virus are the same pathogen (Klenner, 1949 & 1974). Even before Dr. Klenner's observations were published, another researcher reported results just as astounding when measured against today's mainstream therapies. Dainow (1943) reported success with 14 shingles patients receiving vitamin C injections. In another study, complete resolution of shingles outbreaks was reported in 327 of 327 patients receiving vitamin C injections within the first 72 hours (Zureick, 1950). While all of this data on vitamin C and shingles is quite old, there is an internal consistency among the report in how the patients responded. Until further clinical trials are conducted, these results stand. They clearly show that vitamin C should be an integral part of any therapeutic approach used on a patient presenting with shingles. Vitamin C has a general virus-inactivating effect, with herpes viruses being only one of many types of virus that vitamin C has neutralized in the test tube or has eradicated in an infected person (Levy, 2002). As with the inactivation seen with other viruses mixed with vitamin C in the test tube (in vitro), two early studies were consistent with the clinical results later seen with vitamin C in herpes infections. Vitamin C inactivated herpes viruses when mixed with them in the test tube (Holden and Resnick, 1936; Holden and Molloy, 1937). The most important factor in the treatment of any virus with vitamin C is to give enough, for a long enough period of time. Certain chronic viral syndromes do not promptly resolve with vitamin C administration, but there is yet to be an acute viral syndrome that vitamin C cannot resolve promptly, unless the patient already has extensive tissue/organ damage and is literally only moments away from death. Vitamin C accumulating inside viral particles can rapidly destroy viruses by that approach. The spike of the bacteriophage virus is laden with iron, and the focal Fenton reaction is probably how it penetrates its host cell membrane (Bartual et al., 2010; Yamashita et al., 2011; Browning et al., 2012). Viruses accumulate iron and copper, and these metals are also part of the surfaces of viruses (Samuni et al., 1983). As such, wherever the concentrations are the highest, vitamin C will focally upregulate the Fenton reaction, and irreversible viral damage will generally ensue. Fenton activity and its upregulation is the only really well-documented way by which viruses, pathogens, and also cancer cells can be killed by vitamin C, and it is the stimulation of this reaction by vitamin C that makes it therapeutically effective in resolving many infections and cancers (Vilcheze et al., 2013). Vitamin C helps resolve infections of all varieties, but its effect on acute viral syndromes are especially dramatic and prompt, and it should always be part of any treatment protocol for an infected patient. 3. Dainow, I. (1943) Treatment of herpes zoster with vitamin C. Dermatologia 68:197-201. 4. Holden, M. and E. Molloy (1937) Further experiments on the inactivation of herpes virus by vitamin C (L-ascorbic acid). Journal of Immunology 33:251-257. 5. Holden, M. and R. Resnick (1936) The in vitro action of synthetic crystalline vitamin C (ascorbic acid) on herpes virus. Journal of Immunology 31:455-462. 7. Klenner, F. (1974) Significance of high daily intake of ascorbic acid in preventive medicine. Journal of the International Academy of Preventive Medicine 1:45-69. 8. Levy, T. (2002) Curing the Incurable. Vitamin C, Infectious Diseases, and Toxins. MedFox Publishing, Henderson, NV. The overwhelming evidence in Hidden Epidemic proves that oral infections are responsible for most heart attacks and breast cancers, as well as a majority of other chronic degenerative diseases. The Toxic Tooth: How a root canal could be making you sick delivers exactly what the title promises: A surprising, powerful exposé of one of dentistry's most common procedures. The regular intake of dairy and calcium supplementation promotes all known chronic degenerative diseases, and it significantly shortens life. A hereditary defect prevents the human body from synthesizing a natural cure-all made by most animals and found in abundance by primal man. According to national statistics, your odds of developing coronary heart disease may be greater than getting tails in a simple coin toss! Why leave it to chance? 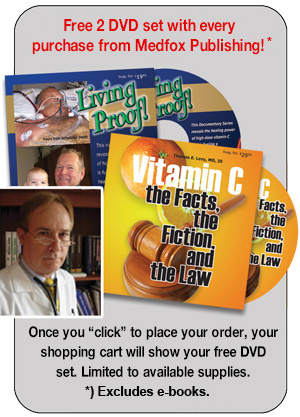 Don't just accept a casual, unenlightened assessment of what high-dose vitamin C can and cannot do. Read the truth for yourself.